If you’re in charge of setting up a computer network - whether it’s an easy in-home network for personal use, or a more extensive network for your business - it’s important to make sure that you’re using the highest quality computer cable possible. 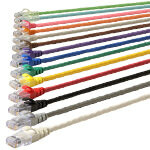 At Gruber Communication Products, we offer a wide variety of cables, one of the more advanced being the cat6 cable. 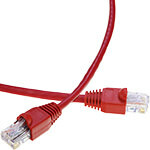 Our CAT6 patch cable comes with a narrow style boot and is ideal for video, data, voice and security communications. Wiring in your office, home, or commercial setting becomes easier with our CAT6 cables that are available in an assortment of colors and sizes. Get faster ethernet speeds with our Category 6 cables that come in custom lengths to fit your specific needs. These CAT6 cables are made from 100% bare copper and are the perfect solution for all of your networking needs. 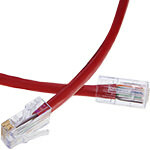 Typically found in most server or network rooms, this plenum CAT6 cable is generally used for patch panels or any other gigabit ethernet equipment. These types of cables are used for sending data signals across a computer network. A cat6 cable is more advanced and typically provides the best performance, supporting 10 Gigabit Ethernet and operating at up to 250 MHz. We also sell the even more advanced cat6a cable, which is able to perform at a higher capacity and send data over longer distances. The cat6 copper cable has been proven to be easy to install, strong, have great electrical connectivity, and easily resist corrosion. 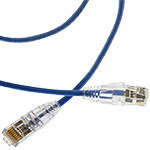 In addition, we also offer shielded cat6 cable, which is good for networks that need more privacy; solid cat6 cable, which are usually less expensive than their stranded counterparts; and non-booted cat6 cable, which take up less room and is easier to plug and unplug in a crowded network.